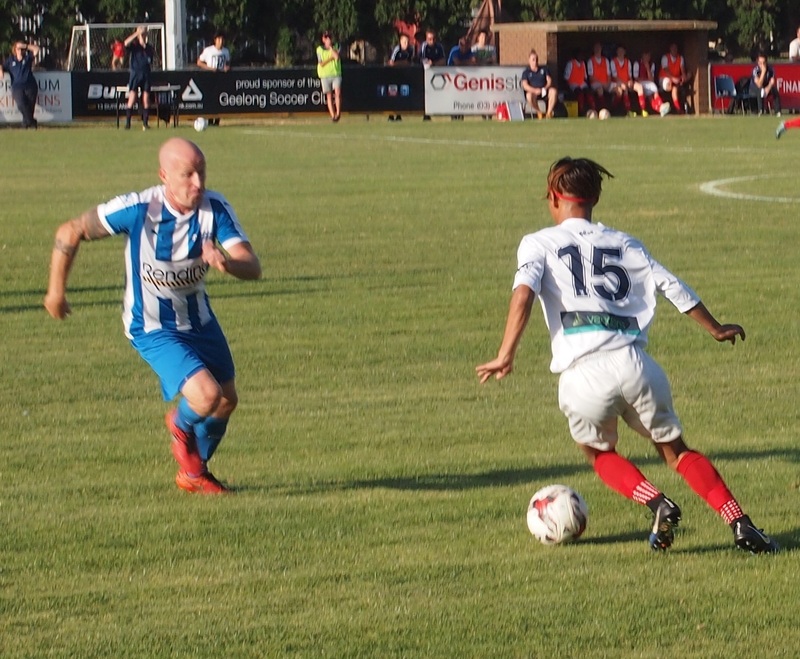 After Geelong Rangers fielded some of its promising youngsters but still ran up seven goals against a scoreless Barwon and Geelong scraped home by two goals to one versus Bell Park, it seems odds on that the two winners will meet in the final of the Geelong Community Cup this year. The two clubs meet in the last match in the round robin phase so they will have to decide whether to reveal their hands ahead of the final. Corio could upstage Rangers but only by running up a cricket score against Bell Park, while Rangers would have to lose heavily to Geelong. Two 13s. Carlin McLoskey of Rangers in white fires a shot, while Oscar Petering of Barwon tries to get his body in line to block it. 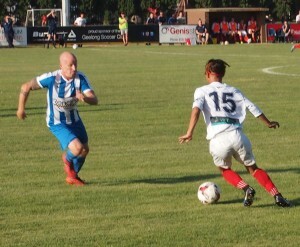 In the early game Rangers was on the board in the second minute when Jeff Noe finished off a cross from the right. Six minutes later the young winger had a good shot parried by keeper Yanni Gilbert but James Hidic put away the rebound. Jasko Ikanovic was the only senior citizen on show in the Rangers attack and he scored twice, the first with a clever back heel and the second when he tried to pass across the goal area, but a defender returned the ball to him and he does not turn up gifts like that. Two minutes into the second half John Mlonga cut the ball back for Tom Santalucia to score, then Noe had a solo run through for his second and Rangers’ sixth. In the last minute Mlonga robbed the last defender who dwelt on the ball for the final goal. Earlier James Nichols had two good chances in a late Barwon flurry, but his first header came back off the post and then he shot wide after beating two men on the bye line. 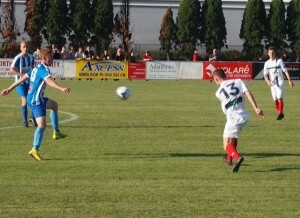 Geelong and Bell Park slugged out a high quality game with little between the teams in the first half-hour. Mijo Marinovic missed a clear opening for Park, but Matt Thorne showed him how for Geelong with a precise shot into the top corner. 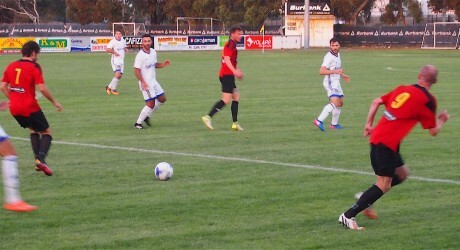 When Daniel Conte was brought down on the edge of the Geelong penalty area, Nathan Munoz put one of his trade mark free kicks past Dylan Nikolovski for the equaliser. 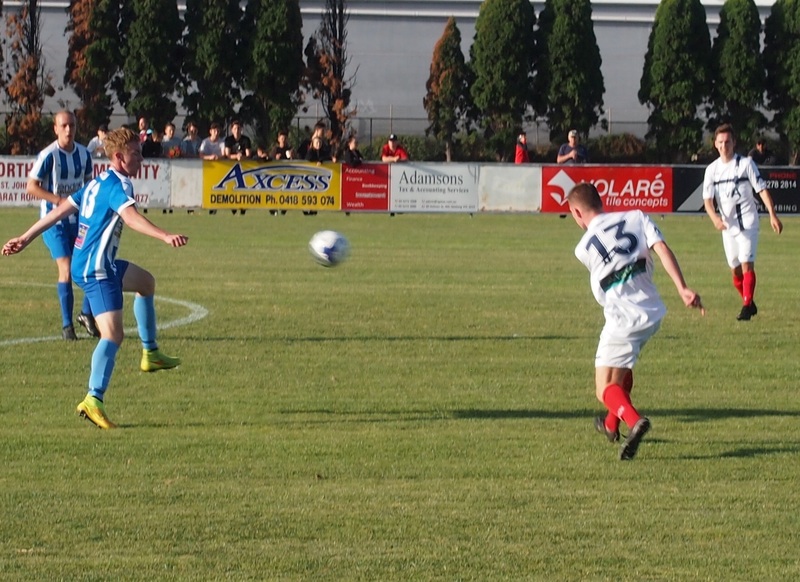 Then in injury time in the first half, Geelong got a free kick in a similar position and Josh Talev showed that he could match Munoz in the free kick stakes. Midway through the second half, Chris Balubarova of Geelong was sent off for his second yellow card but Bell Park could not make the extra man pay. Marinovic was through on goal but went down in the area and the referee decided there was no infringement. Park’s last clear chance fell to Munoz with another free kick, but this one went sailing over the bar. There is only one Cup game next Wednesday night when Bell Park plays Corio at 6.30 pm. But it is possible there may be a friendly match to follow. Jasko Ikanovic is now the clear leading goalscorer with 5.